In this 90-minute webinar, Andrew Zumwalt covers the changes and details of the 2017 Tax Cut and Jobs Act, including the doubled standard deduction, the doubling of the child tax credit, and the Affordable Care Act tax penalty. 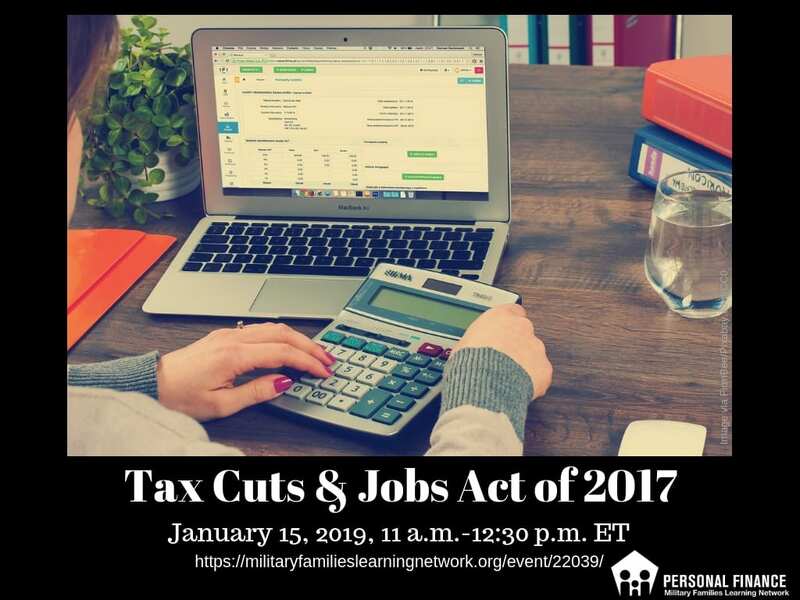 Military-specific tax issues such as the Heroes Earnings Assistance and Relief Tax Act (HEART Act) and the Earned Income Tax Credit (EITC) and military pay will also be addressed. This event is hosted by the Personal Finance concentration area of the Military Families Learning Network. Andrew Zumwalt, Assistant Extension Professor, Associate State Specialist, & Co-Director of the Center for Economic Education at University of Missouri. Andrew has a BS in Business Administration with an emphasis in Economics, a BS in Consumer and Family Economics, and an MS in Consumer and Family Economics. Andrew has been instrumental in founding and growing the Missouri Taxpayer Education Initiative, a program that uses “Taxpayer Assistance as a Gateway to Financial Education.” Over the past six years, more than 20,000 returns have been prepared at Missouri Tax sites and more than $20 million has been refunded; a large portion of these returns have been prepared by students in the class Andrew teaches–Personal Financial Planning 4188: Community Agencies and Volunteerism. Andrew serves as campus support for the state network of Family Financial Education Specialists. He also serves on the board of the local student-managed credit union, Tigers Credit Union. Hi, will the recording be on YouTube after the live event? The live event was held Jan. 15, 2019. For the moving expense deduction can you cover what are qualified moving expenses and how to factor in reimbursement (to include DLA)? Not really a change for military, but there is a lot of bad advice out there on this. Information about the Moving Deduction will be covered in this webinar. Please plan to join us and share your questions in the chat pod on Tuesday. Are you kidding? its 2019 and you want to talk about the tax cuts in 2017? I bet no one will sign up because of this error.